Thomas Mercogliano capped of one of the most prolific careers in NIAA history by winning the Class 2A Northern League MVP award. 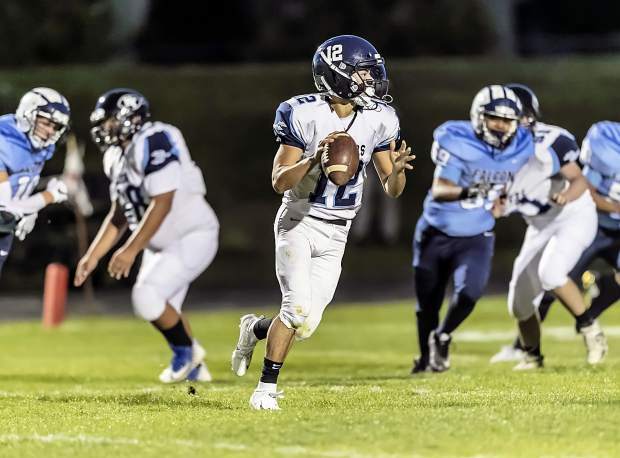 A group of athletes responsible for returning football to North Tahoe High School received postseason accolades for their play on the field this past season, leading the Lakers to the program’s first playoff appearance in more than a decade. As he has from the first day he took the field as a freshman starting quarterback, Thomas Mercogliano led the way for North Tahoe this past year, capping off his senior season as the Class 2A Northern League MVP. Mercogliano, who was also named first-team all state, threw for 1,960 yards and 19 touchdowns this season. He also led the Lakers with 1,378 rushing yards and 14 touchdowns. Mercogliano also returned three kicks for touchdowns, and served as the team’s punter, averaging 43.1 yards per punt. For his career, the four-year starter will go down as one of the most prolific players in Nevada Interscholastic Activities Association history. Mercogliano is one of four players, regardless of class, to surpass 10,000 total yards of offense, finishing his high school career third all time with 10,806 yards, which is the most ever by a Class 2A player. Before the Lakers’ final game of the season, Mercogliano said he’d received more than 30 offers to play collegiately, mostly at the Division III level. Part of Mercogliano’s success is due to the players up front. Senior offensive lineman Phillip Lopez led the group this season, posting a team-high 11 pancake blocks to earn first-team all league and second-team all state. Lopez also earned second-team all league honors for his play on the defensive line this season. He led the Lakers with 79 tackles (62 solo), and also had two sacks and a fumble recovery. Senior receiver Dalton Lamberth was named second-team all league after posting 18 receptions for 347 yards. Junior tight end Max Kelly was named second-team all league after hauling in 20 receptions for 312 yards and four touchdowns this past season. Senior defensive back Tony Frankenberg led the team with three interceptions and a pair of fumble recoveries to earn second-team all league honors. Frankenberg finished his season with 61 tackles and also returned an interception for a touchdown. He also served as the Lakers’ running back and was second on the team with 433 yards and two touchdowns, earning him a place on the league’s honorable mention list. Junior defensive lineman Guthrie Goss was in quarterbacks’ faces all season long, finishing the year with a team-high 5 sacks to earn second-team all league honors. Goss finished the season with 39 tackles and two fumble recoveries. North Tahoe also had a trio of defensive players land on the league’s honorable mention list. Senior linebacker Eli Snyder was second on the team with 74 tackles this season. He also finished the year with a sack and two forced fumbles. Also at linebacker, senior Raul Estrada posted 71 tackles, two sacks and two fumble recoveries this season. Sophomore Tyler Frankenberg was also named to the honorable mention list for his play at defensive back. Frankenberg finished the season with 44 tackles. Coach Everist was named the Northern League’s coach of the year for his job in rebuilding the program and guiding the Lakers to a 4-4 league record this past season. The team will lose a core group of seniors that have helped rebuild the program after the school didn’t have a football team in 2014.